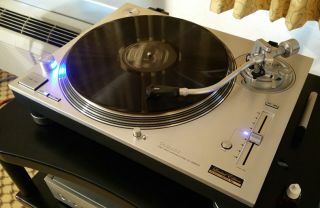 Technics explains SL-1200G price and hints at cheaper turntable | What Hi-Fi? The new Technics SL-1200 turntable has been attracting plenty of attention since it was announced back in January. But alongside the excitement, in hi-fi and DJ circles alike, there were also plenty of raised eyebrows, mainly about the price tag. Speaking to What Hi-Fi? at the Bristol Sound & Vision Show, Technics CTO, Tetsuya Itani, explained that the new deck was a complete redesign, requiring a brand new manufacturing process, using all new tools - and this made for an expensive turntable. Confirming the $4000 price tag would likely translate to “a little under £3000" in the UK, Itani revealed that the price of the new SL-1200 had been a big issue for Technics, too. “The cost was the biggest problem for us, from the start of the project. And there’s a reason Technics had to invest all over again: none of the old tools and machines were available, having been destroyed or badly damaged. So Technics had no choice but to design the new deck from scratch. And this was no bad thing, said Itani. "We began to study just a few months prior to IFA, maybe summer 2014, for the new SL-1200. We learned that it was impossible [to make the same deck], as almost all the tools for manufacturing were gone or heavily damaged - only one "die" remained, and that was for the dust cover. “All the documents were kept, all the drafts… but it was not the Technics way. If we have a chance to start from scratch, we should. With new technology, new theory - that is this guy [the SL-1200G]. So it’s a new model from scratch. And Itani knows the performance needs to justifty the price tag. “Every part is designed for better sound quality. We are thinking of course it is a 1210…. but performance wise it’s SP10 MKII level.” The Technics SP10 MK II was an expensive, heavy duty hi-fi turntable that launched in the mid-1970s. But if you’re not ready to part with the best part of £3000 for a new Technics turntable, could there be a more affordable SL-1200 on the way? Following some nervous laughter, Itani replied: “Right now, we start thinking [about a more affordable model]. But not definitely right now. We need to study,” said Itani with a smile.